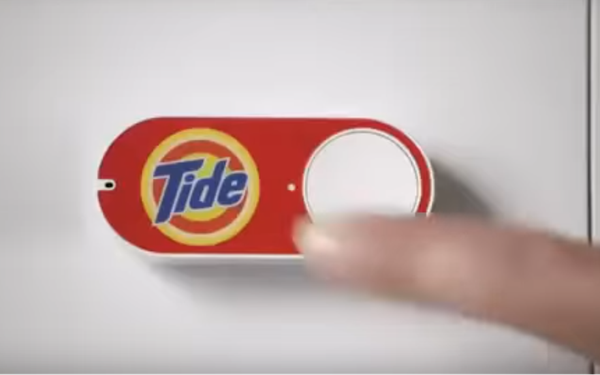 Amazon is discontinuing its Dash buttons, the tap-to-reorder device consumers could use to replenish household staples like name-brand household cleaners, detergents and some toiletries. Why? Because since they were introduced (with some derision) in 2015, many more connected devices have come on the market that let Amazon shoppers restock their pantries — including, most obviously, its Alexa-connected devices. Also shoppers can now download virtual Dash apps that do the same thing. The demise of the device was first reported by CNET. The Dash buttons, about the shape of a small sardine tin with an adhesive backing so customers could attach them to refrigerators and coffeemakers, will still be serviced by Amazon to existing users, but it’s promoting two other models it’s introduced in the last couple years that do the same thing. Now the Virtual Dash Buttons Service does the same thing the physical Buttons did, except consumers access them via any screened device. And “Dash Replenishment” for connected devices automatically reorders products: A smart dishwasher reorders detergent, a smart printer reorders ink, and so on. They may live on, though, as a kind of iconic marker of the times, a “smart” way to shop in 2015 that now seems a little clunky. When Dash was introduced, the Internet of Things was a more foreign concept than it is now, just a few years later. Indeed, some thought it was an April Fool’s Day joke, except Amazon actually announced it on March 31, 2015. A few days later a Forrester Research report aimed at CMOs called it “the best bad idea of 2015,” though the report predicted it was a precursor to other ways online merchants would try to make the buying process more “frictionless” for consumers. The button was, in that sense, right on the button. In the months that followed, more ecommerce sites added “order now” buttons alongside featured items, making the decision to buy a little more impulsive. 1 comment about "Amazon's 'Buttons' Are IoT History, Replaced By Alexa". PJ Lehrer from NYU, March 4, 2019 at 12:20 p.m.